FHA home loans are attractive to many borrowers because the FHA guidelines are more forgiving with FICO scores, and a lower down payment is required than for some other mortgages. But your down payment requirements aren’t just set by the FHA; lender standards also have a say. September 30, 2018 - FHA home loans are attractive to many borrowers because the FHA guidelines are more forgiving with FICO scores, and a lower down payment is required than for some other mortgages. But your down payment requirements aren’t just set by the FHA; lender standards also have a say. Some borrowers come to the FHA loan application process with higher FICO scores which may make them eligible for the lowest possible down payment. Others come to the FHA loan process with FICO scores that don’t allow them to qualify for maximum financing; these borrowers may have to pay 10% rather than 3.5% down on the adjusted value of the home. 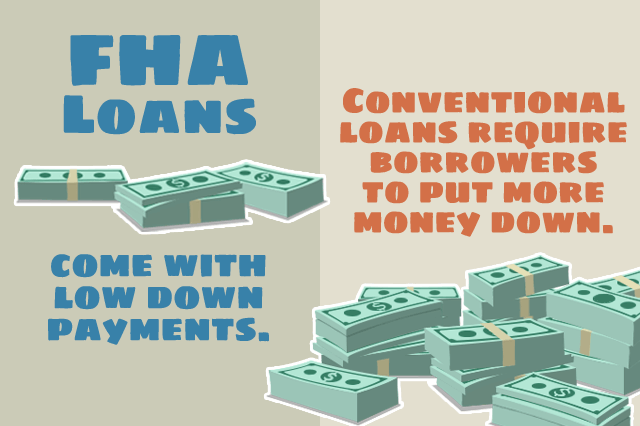 In the FHA loan rulebook, the lowest FICO score possible to still qualify for the lowest down payment is 580. Home loan borrowers want the option of the lowest down payment possible; it’s important to remember when budgeting for the expenses of your FHA mortgage loan that down payment money and the other cash required to close are kept separate; the cash you need to close for the other costs of the loan are not part of your down payment. That is why borrowers tend to explore their options for down payment gift funds from friends, family, or employers. They also often explore their options for down payment assistance from a charitable organization that meets FHA loan requirements. Down payment assistance is available from local agencies, the FHA does not provide this assistance or offer endorsements of those who do. But the option is worth exploring. Borrowers who are concerned that their FICO scores may put them in a bracket that qualifies for a higher down payment should consider taking extra time in the preparation stages of the FHA home loan to work on improving FICO scores. This can be done by reviewing credit reports and contesting inaccurate information, and by making at least one year’s worth of payments on time, every time. It also may help a great deal to reduce the balances on credit cards and avoid applying for store credit cards. Borrowers who are working on higher FICO scores before applying for an FHA home loan should contact a participating lender to learn what FICO score requirements for the lowest down payment might be at that financial institution. Policies will vary so it is a good idea to shop around for a lender willing to offer the most competitive terms for your loan. Down payments are not optional for FHA mortgages. Some borrowers may choose to finance other expenses associated with the mortgage loan where permitted to be able to afford the down payment. If you are considering doing so remember that the FHA Up-Front Mortgage Insurance Premium may be financed rather than being paid in cash at closing time. You can either finance it in full or pay it at closing time in full, but partial payments are not permitted. If you need gift funds or down payment assistance, it may be a very good idea to ask a loan officer for the gift funds standards for that lender and ask if there are down payment assistance programs that have been used at that financial institution before.